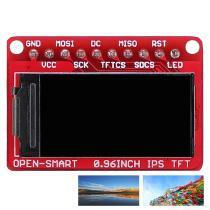 This is a 0.96 inch IPS TFT LCD expansion board with serial SPI interface. This display has a controller built into it with RAM buffering, so that it is easy to control by MCU. It leads out the pins of the TFT and breakout pins pitch is 2.54mm, so the secondary development is easy. – LED pin is pulled up to VCC so you can keep it all day on if you do not use it. Transistor connected so you can PWM dim the backlight.